This new Parisienne ice cream parlour, La Glace, holds a special place in my heart as I met owner and ice cream master, Mark, around the time I started Pink Tea Latte. In fact, we were both just beginning our new ventures, so when I heard Mark's ice cream cart was now a storefront, I had to go congratulate him in person! Mark and ice cream are like me and green tea lattes, it is an integral part of his life and has been since he was a young boy. Thinking he needed to lead a more "serious" profession, Mark began working at a bank, but frankly his heart remained elsewhere. 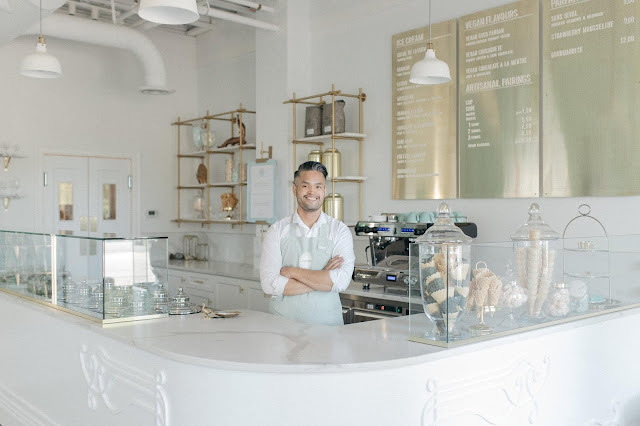 He actually sold homemade ice cream during the holidays to his co-workers at the bank and they all agreed that he did not belong in an office.So in 2015, Mark said goodbye to the mundane nine to five work life and decided to pursue his culinary dreams. 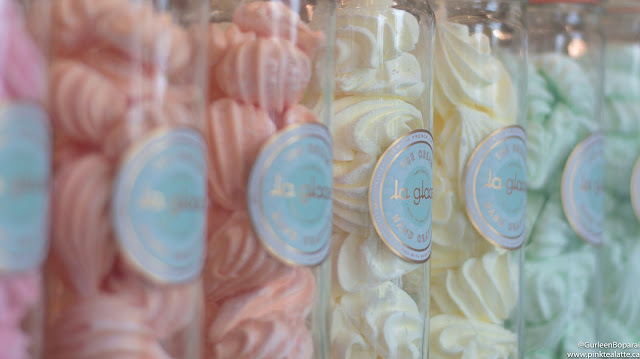 The little La Glace ice cream cart could often be spotted at Holt Renfrew, William-Sonoma and private parties. 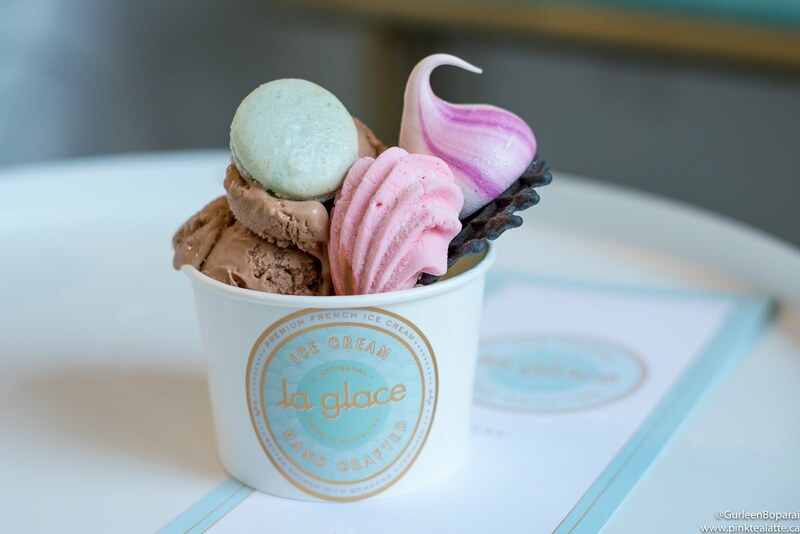 Sitting on the corner of West 16th and McDonald, this boutique ice cream parlour, La Glace, is a refreshing new addition to the saturated ice cream market in Vancouver. The moment I stepped foot inside, I was transported to a world of chic Parisienne patisseries. Beautiful white carrera marble glistened from behind the showcase which was offset by muted gold fixtures and accents. From the chrome carapina lids to the teal blue upholstery, every little detail was selected by Mark and his team. Just like the style of his shop, Mark is the first to introduce Parisienne style ice cream to Vancouverites. Only the best ingredients are used in the making of La Glace ice creams like local organic Avalon milk and cream, fresh BC berries, freshly cracked eggs and real vanilla bean pods. French style ice cream is made with a base with a base with more heavy cream than milk and thickened using egg yolks. The result, a luscious and velvety textured ice cream. Since so many egg yolks are used in the making of La Glace ice creams, I was curious to know what happens with the whites? The beautiful coloured meringue kisses, marshmallows, rocher and macarons that are available as toppings are made using the left over whites. I sincerely appreciate the effort La Glace has made to use ingredients to their fullest; therefore, reducing waste and being that much more sustainable. It also means La Glace has the most bougie ice cream toppings ever and did I mention, one topping is included in the price of your ice cream - YAY! The french ice creams are all churned in house and the flavours will be rotating on a weekly basis. Favourites like the Creme De La Creme, Ganache and Chocolat A La Menthe will be always available, but other flavours like the Citron, Bananes Foster and Muscadine will come and go. Also on the menu are vegan french ice creams, but how Mark attains the silky soft texture without a traditional egg creme anglaise remains a secret. I love how Mark has taken inspiration from his Filipino family to create the Vegan Coco Pandan ice cream which is a decadent pandan infused coconut cream - tasted phenomenal! The Creme de Le Creme may just be my new favourite vanilla ice cream as it was this silky custard like pudding in ice cream form. A close second from the flavours I tasted was the Honey Laurier, an unexpected combination of almonds, burnt honey and bay leaf. I loved the crunchy texture from the unpeeled coarsely chopped almonds as well as the subtle sweetness of the bay leaf and burnt honey. If you are a big peanut butter person, I highly suggest the Vegan Chocohuete. It is a little denser in texture, thus taking a little longer to melt, but the rich peanut butter was balanced by the addition of chocolate flecks. The kitchen is my playground. I am constantly thinking of new recipes and flavours. 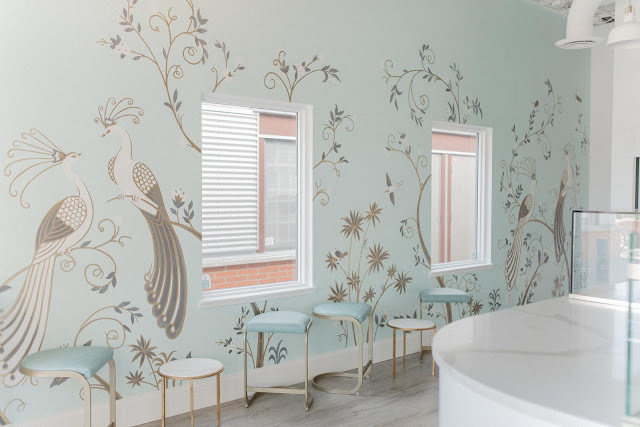 My favourite part of the new La Glace brick and mortar store (aside from the decadent ice creams) was the stunning hand painted mural on the west wall. Four beautiful peacocks perch on a branch amidst swirls of gold filigree, white flowers and tiny song birds. I really cannot express how badly I want that exact mural to be painted in my room. A mix of art-deco and art-nouveau, the mural brings an elegance to the already stunning La Glace. Mark was kind enough to share with me why peacocks play such a big role in his branding. His late aunt had a big hand written recipe book from which his mum cooked from, which eventually fostered a love of baking and cooking in Mark. Alongside the cookbook, his late aunt's beautiful pair of peacock statuettes were passed down to Mark which he cherished. The amazing team at Arithmetic Creative worked closely with Mark in developing the branding for La Glace and executed the mural flawlessly. 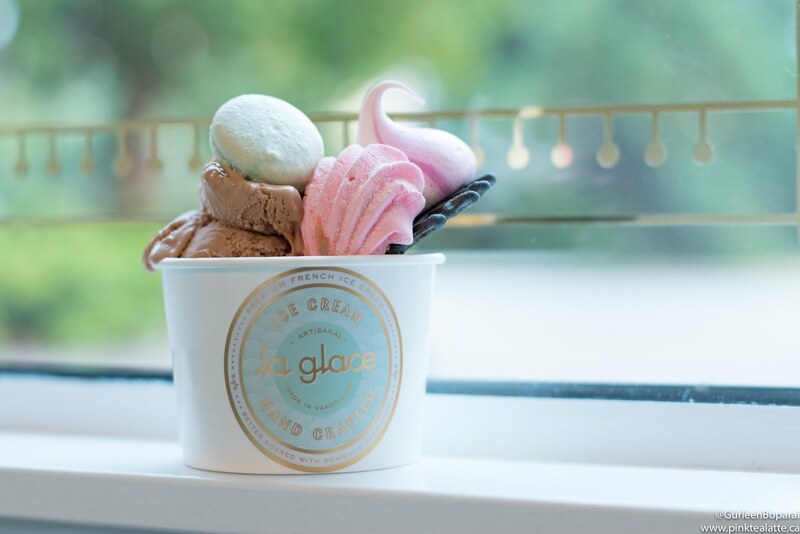 La Glace is now open and scooping delicious French ice cream for everyone to enjoy during this crazy Vancouver heatwave. In the coming weeks, expect to see takeaway ice cream pints, Macaron/Cookie sandwiches and profiteroles.